ASL club leaders teach new members basic sign language Thursday night. While learning a language can be difficult, club leaders look to make it easier to manage. Photo by William Craine. Learning a new language often involves many classes and a lot of hard work. 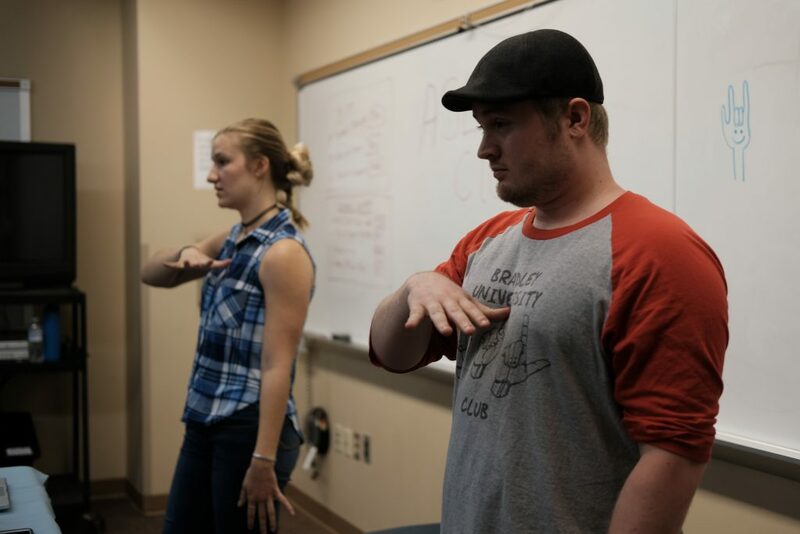 Bradley University’s American Sign Language (ASL) club is a great way for students to learn a new language in a fun way. The club has been on campus for many years, but the number of members has dwindled. Only a few years ago did some motivated students take it upon themselves to bring the club back to life. 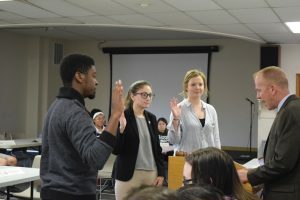 After some cycles of the executive board since the resurrection, junior health science major Carol Randolph now proudly represents the club as president. ASL club aims to teach students new vocabulary while reviewing what was learned the previous week each meeting so that they can apply the language to every day experiences. Those looking to join the club do not need to have any previous knowledge of sign language. The process of learning a foreign language can sometimes be difficult to practice and integrate into everyday life, but ASL makes it easier. 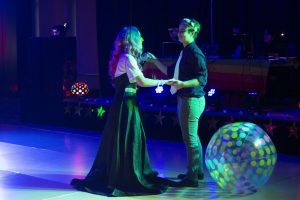 ASL club is not just about learning another language. For Randolph, it’s a part of being inclusive. “I think it’s important for, just, you know, equality and basic conversation. It’s always a joy … when you meet somebody who’s deaf, and you know just a little bit of sign language, to see, like, the lights, like, flicker in their eyes, because they’re like, ‘oh my gosh, I can actually communicate to this person without … a struggle,’” said Randolph. The ASL club travels outside Bradley’s campus and ventures into Peoria to interact with the deaf community. Silent Suppers are held every Thursday by Peoria’s deaf community. Those who attend the Silent Suppers travel to different restaurants for an experience that is unique. Members of the ASL club are invited to join the event in order to get some practice and meet some new people from the community. American Sign Language club meets in Bradley Hall 225 every Thursday from 7:30 – 8:30 p.m. Those interested in joining are welcome to attend a meeting or contact bradleysignlanguage@gmail.com.